It's an I-Pad World. Not! A TV spot from France takes up the debate between 'all digital' and the die-hard defenders of paper. "The job isn't over until the paper work's done." THERE WAS A TIME when I subscribe to both TIME and NEWSWEEK magazines. I was young, and ignorant/naive, and living in an apartment house in Oakland, California. (Thank goodness the "Three Strikes Law" doesn't apply to non-felons!) Besides, my neighbors stole my magazines from the mailbox so frequently, I didn't get to read most of the magazines I had paid for. Eventually, though, even the highly filtered contend I DID read got through to me. I realized that the things they were saying in their articles were not "factual reporting" but "emotional reporting". In a word every political article was slanted ... slanted in a way which was directly opposite of my own personal convictions. Today, I don't even have my television hooked up to cable, and I get the same or more 'content' from the Internet .. as my access to this article demonstrates. There's a saying that "no cops are Democrats"; and I suspect the same is true of Military, both active and past-service. This article is a sterling example why those of us who have put our lives on the line for our community, or for our nation, have rejected the Liberal/Progressive/Democratic party line. Looking back at the article (scroll back, or check the link), you'll notice that I've high-lighted some of the comments in the original article in red. I don't have an issue about the President getting angry, or about TIME applauding his lack of perspective. Okay, maybe I do, but I get angry all the time and I seem to always be able to justify it, at least in my own mind. I'm not the President of the greatest nation in the free world, though, so maybe I'm a little bit peeved that the President can't control his own emotions, and couch his expressions in a more civilized manner than a guy in a sloppy home-office in Oregon. I find it disconcerting that our political leader cannot say that he's unhappy that he hasn't universal approval from his subjects the citizen of his nation without accusing them of lying. Going back to the original quote, when a media source which is internationally recognized for its integrity uses such phrases as ".... the Senate had shamefully failed to pass a bill ...", that's a sure sign that this media source has renounced its claim not only to impartial reporting, but to integrity itself. And when the President claims publicly that some of the media constituents " ... willfully lied ... ", that goes beyond the gentile bounds of public discourse. The TIMES article goes on to throw the phrase "Shamefully" at least once more. Where's the Civility? Where's the Impartiality? Where's the journalistic integrity? Gone, in sixty seconds, like a 1971 Mustang Fastback. I'm not surprised that TIME magazine could throw its integrity under the bus ... and not even all that surprised that the President would do the same thing. I'm just really disappointed. Get the picture? It's not PRESIDENTIAL! It's Presidential. I don't like it when I have to evince respect for a President who seemingly makes every effort to undermine my respect for the office. I've already given up respect for the man, but I'm loath to give up respect for The Office. What is going on, when I think about meeting the leader of our nation, and I'm appalled by the prospect that I might actually be expected to shake his hand .. and smile? There was a time when I thought it would be the greatest honor of my life. I've given up my dream of going to our nation's capital, to visit The Wall and honor my fallen comrades. The odds are slim, but still possible, that I might actually meet the President. I'm sorry for the demagoguery, but I just can't help (myself) when it comes to the President. The Target Is Moving (T.I.M.™) line of electronic target systems features a compact, portable target base which features an interlocking cardboard target. The T.I.M. system offers several operating modes with adjustable speeds and can operate in a 360 degree fashion. With the optional remote control users can control a single target or multitude of targets wirelessly. The system runs for hours on rechargeable AA batteries for ease of use and maximum uptime. Because the target surfaces are cardboard the system is safe to operate at indoor ranges as well as outdoor. T.I.M. can also be deployed in the classroom as a dry fire training or instruction tool. The T.I.M. target looks good for an indoor training aid. The target system comes with light-weight cardboard targets on a LOOOOOOOONG arm. I noticed that in their demonstration video they have an IPSC "Metric" target propped up in the background. This suggests that the system WILL handle the bulk and weight of the large cardboard target ... but even though it looks like a fun addition to the variety of shooting challenges presented in IPSC matches, I'm unconvinced that such a small unit can be useful in a competitive environment. Picture sixty or more competitors running through the stage in a few hours in a hot Summer day. Worse, during rainy weather (and we have enough of them here) will it function even when wet? I'm ... not sure. So I answered their "Contact Us" website page and asked for more information on these and other questions. At $500 per unit (including remote controller), they're going to have to prove that they're reliable AND durable before any club is going to risk the expense ... even though they do have a free "loaner' program for certified instructors. The mechanism looks pretty good for indoor training ... but who (other than, perhaps, LEO trainers) is going to put up that kind of money for a pretty toy? Despite my pessimism, it may be that the manufacturers could use this question to advance development of something that IS applicable to competition. The first thing is .. we build a very strong shield so I can't hit the motor! Gun Crime is DOWN? Who knew? Two new studies: Gun crime has dropped dramatically over last 20 years — and most Americans have no idea � Hot Air: Despite national attention to the issue of firearm violence, most Americans are unaware that gun crime is lower today than it was two decades ago. According to a new Pew Research Center survey, today 56% of Americans believe gun crime is higher than 20 years ago and only 12% think it is lower. We talked here about the Broken Windows theory, exactly three months ago today; that was mainly in reference to the slaughter of innocents in Chicago. You and I are obviously not the only ones who are aware of the theory, and how it has been supported by good results upon its application my municipal authorities. It's not that there aren't answers to Gun Violence; it's just some people would rather compromise our civil and constitutional rights, than to do something that has been shown to work? Why is this? Other than that our "leadership" is arrogant and arbitrary? The answer is that it's a lot easier to pass more laws than it is to do an honest day's work, for some people. Is your life better now than it was in 2008? 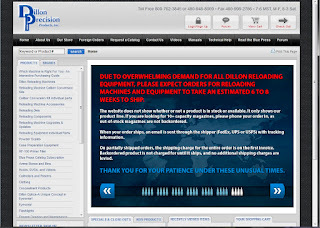 We keep hearing that the demand for firearms, ammunition, reloading supplies is due to 'normal' market pressure. 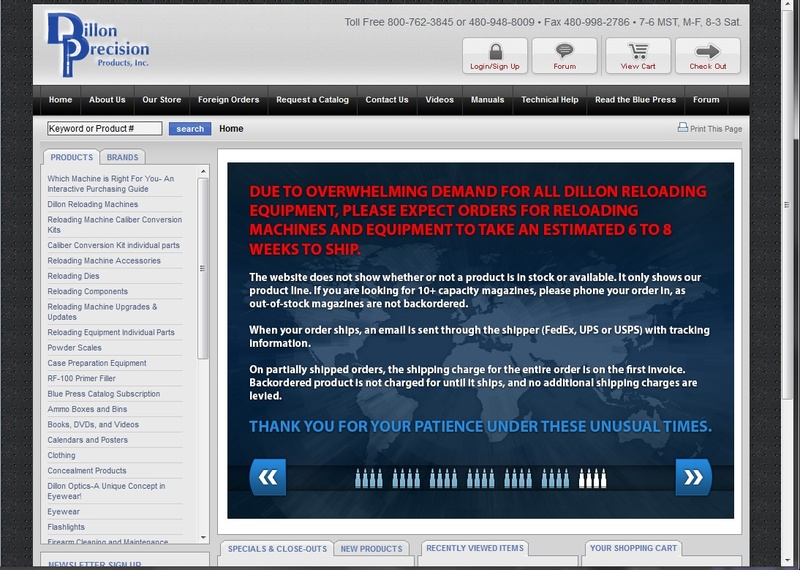 I've never seen anything like this on Dillon's website before, not even in 2008, when Obama was first elected.